It was 7.30 in the morning, I was having my usual ‘jogging’ activity at my favourite spot – the track in the vicinity of Masjid Tengku Tengah Zaharah. 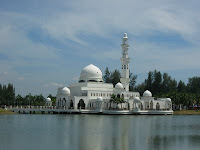 We locals called it Masjid Terapung or reffered to as Floating Mosque. Its one of the icons of Islam in the state. Being a weekday there were not many joggers around except for a few. Going by theirs attires they were the jemaah who I thought decides to stay back for their briskwalking round the track. The track was wet due to last night downfall. I decided not to continue but instead make a detour down the beach. Yes during the monsoon most coastal part of K.Terengganu were full of debris. You could see stretches of all kinds of everything,, uprooted trees, plastic bottles, diaphers tangling with the branches along the coastline. These deposits were pushed ashore from the ulu areas by the gushing waves. Terengganu Equestrian Resort(TER) is in the background. The sandy beach seen here is once a anglers haven with fishes like Ikan Kakap Merah, (Red Snapper)Kuku etc ...now its fill with sand brought by the gushing waves over the years. Those who frequent the place will testify to that. While combing the beach I stumble upon a few buah gomok nicely snug among the debris. Awang Goneng describes in his GUIT’ ‘’ as the flat shelled , tough and dark as ebony . ....I took it home and had a plan in mind. .. So folks, to those who doesn’t know how a buah gomok or buah ipir looks like, its my pleasure here to show you some images of them which I salvage from the debris. Sir, I see that you are one healthy man. Good for you. Jogging, scientifically proven, is a good cardiac exercise, and as a mean to reduce stress. You made it a regular activity, well, you have my respects sir. Buah gomok, yes I know how does it looks like, but the use, not a clue; until I read the book which provide a rough picture, and you gave me a clearer picture. I see that handicraft of gomok is very interesting, I wonder if the local people do commercialize this natural gem. Thanks for the visit.And the added information on jogging.Everyday if times permit I would head for the Masjid Terapung track with my other half tagging along for our slow jog or briskwalk. Alhamdulillah till now we are blessed with good health and we are most thankful.My daughter bought a condo at Pelangi Damansara so whenever we are in KL we frequent TTDI park or just the gymn.I am yet to try the sauna.Im sure Pak Zawi can shake some light on this. As for the buah gomok I used to collect them by the beach when i was a kid and used it as what AG beautifully describes in his GUIT.I dont quitely know their other uses beside that.The gomok trees grow by the river bank and when the seed ripen it fall into the river then push to shore by the monsoon wave together with other debris. Those days they were in abundance. Now its very rare to find them maybe at remote places.This is due to human activity along riverbank, and the no commercial value for the tree; they were chopped down. Have a nice and Happy New Year. I adore your courage to jog everyday. Yours truly havent exercised in years. I shudder with guilt everytime I look at people who exercise like there is no tomorrow. Anyway, this mosque holds dear in my heart. When I was 16, during our weekend outing I used from MRSM to go there with my, well, boyfren masa kecik-kecik. Hah, what a walk down the memory lane. Elviza, the pleasure is all mine. You dont need a permission to trail here. Its nice to know the masjid unfold 'fond memories' not only to you but to many others. Its a favourites spot for tourists especially durings the holidays you could see buses with loads of them; they stop for prayers or just for admiration. Oh yeah about the jogging;having retired and having ample time with nothing much to do so why not do some exercise just to keep fit. Thank god Im blessed with good health as for now though. You said you're an exMRSMer. What year was that? Ok bye for now. Warm regards to you and Jefree and Luq(Luke Skywalker! )OH like I know them already. changgeh, A great write up of a day at the beach. How I wished I could do that every morning like you. The fresh air and the open sea with its golden sand. The beach I frequented in front of my condo in Pantai Putri Melaka do not have the golden sand like on the east coast. When I was growing up in Kuantan, this buah gomok is a common sight on the beach. The next time I am on the east coast I would look for it. Its nostalgic and bring back beautiful memories of growing up on the beach at Telok Cempadak in Kuantan. Indeed a great information for the present generation. Have a nice day. Thank you for stopping by and the compliment about my posting.Seeing the buah gomok lying there among the debris were both exciting and nostalgic.Thelast time was twenty or thirty years ago.Its very rare now or its there but we don't go looking for it.GUIT has certainly take us all down the memory lane.The present generation I'm sure doesn't know what a gomok seed look like if we don't take the trouble to show or explain to them. Retired and having all the time at our disposal, a slow jog every morning would certainly make us feel healthier. tulih lah lagi pasal T'ganu...rindu lah saya pada tempat itu. p/s: Luke Skywalker is down with chicken pox! hehehe... perhaps due to its easy availability we tend to pass up the chance of making use of these buah gomok. maybe I will bring the AKSes to gather them one fine day and do what AG did in GUiT. Just dropping by to wish you: HAPPY NEW YEAR 1429... may we be blessed by HIM all year long... and beyond! i know tepung gomok, but not buoh gomok... thanks for showing the picts, now i know. anyway, happy new year 2008 & happy ma'al hijrah 1429!! may this year brings brings baraqah & His blessings 2 u n family. When Awang Goneng mentioned buah gomok being used as skimming stone I suspect the fruit to be the same as our buah beluru. Now seeing your picture of it, I can confirm it as truly buah beluru in Kelantan. When I was small we used these seeds to play two kind of games using the bare feet. By twisting the foot against it so that the side of the big toe will hit the horizontally laid buah beleuru to send it towards another seed set on it side on the ground by the opponent. We are allowed 3 strikes to hit the target. The other game is to bore one hole on one side and another two holes on the other side. The content of the seed is removed using a sharpened spoke of the bicycle wheel. A long string is inserted through the holes and the seed can be made to spin as long as we want. I will ilustrate it later in one of my posts. Last week I was in Kota Bharu and I met a traditional medicine seller and I saw the buah beluru. I bought two pieces for a ringgit. She said the seed content can treat several ailments such as to cleanse the kidney. I bought another kind of seeds which we call buah gorek. These seed when it was abundant was used to play the congkak. Rubber seeds can also be used. Nowadays glass marbles are used because of its availability and uniformity of size. Buah gorek is the best because it is quite rounded, light and quite small so its easy to handle. Ahh too long. I will blog about it. In Kelantan it is called buah beluru. Used to play with it when young. Thanks for the visit. Sorry for the late response to your comment.I was away for most of the first week of February and moreover the place dont have internet facilities. You're right in Kelantan it's call buah beluru and the game associated with the seed varies from place to place. I dont know its others uses though. But when the traditional medicine seller said the kernel has medicinal value...well its yet to be proven. Initially I thought my earlier post didn't get through so i sent in another post as a test case. Even that didn't seem to get through. Now only I know why hahahahaha. Thank you. I have seen the buah gomok tree myself. But, thebuah gomoks as shown in the photos are called by another name at the kampung where the tree is found. They are called buah gandus.In the old days the kampung children use them for playing a game call "main gandu". What happen? How come there is no new postings? Please come back.